Days after he was fired from President Rodrigo Duterte’s Cabinet, ex-DILG Mike Sueno called mar Roxas as a man whom he respects highly. 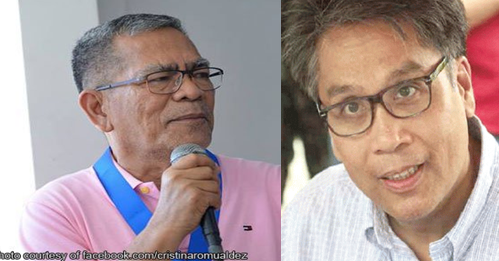 “Ako I have very high respect naman for Mar Roxas eh,” Sueno told well-wishers Thursday (April 6) during his farewell party at the DILG-Napolcom building in Quezon City. Sueno is known to have been instrumental to President Duterte’s election campaign. This earned him his juicy post at DILG in the first place. Sueno was fired by President Duterte Monday (April 3) during Cabinet meeting at the Malacanang. The context of Sueno’s positive statement on Roxas had to do with his refusal to blame his predecessor for the DILG’s problems. “Ngayon, bakit ko hanapin? Gusto ko concentrate lang tayo sa mga projects. Always think of now and the future, not the past. Let us learn from the past, pero wag nating halungkatin yun,” he explained.